This blog is for English translations of Finnish writings that could be of wider international interest – usually posted with the original authors’ express permission. In order to understand the meaning of the new European missile defense system in particular, one must know a few underlying facts about nuclear weapons, missiles, and geography. The much debated US missile defense system in Romania came online this May. The US has stressed the threat of Iranian ballistic missiles, whereas Russians have felt it was a move against them. The European ground stations as far as capability is concerned shouldn’t pose any greater threat to Russia than Navy vessels already do. Russia feels ‘forced’ to counter the move with actions of its own. Russia has stated that the INF treaty has become obsolete because of the new NATO bases. According to the argument this doesn’t work anymore when a flight from Estonia to bomb St Petersburg takes only 10 minutes. Some have voiced suspicions that Russia itself could be developing missiles specifically for the Iskander platform that would be in violation with the INF. It seems very likely that both the US and Russia share a view of the true significance of the missile defense in Europe but choose not to say it as it is: there is a belief that the other side is already in breach of the INF treaty. I never felt that I was given any disadvantage or advantage because of my gender – until I entered the political arena. I had been known as an expert with professional accomplishments when all that vanished. After I became a politician I was nothing except a “young” ambitious woman. If I may, I would ask one thing from you, respectable reporters. Don’t make gender or other meaningless markers like age a burden for us politicians. Don’t purposefully set up gal-on-gal or old geezer-on-old geezer debates. That categorizes us from the start. My dad asked what I’d like for a present. “A computer,“ I said. I had always wanted a computer. A girl excelling in math might think that it is not possible to make it her profession, let alone be specialized in something that sounds as boring as coding. A woman’s problem in the coding market is to be taken seriously. How do I present myself as a capable employee without additional proof to cancel out the negative impression due to my gender? How can I avoid a situation where my attractiveness sets the overall tone for the interview? If I stay after hours, will I be faced with a slimy creep that will climb up my skirt? Will my coworkers be decent, will they include me, and will I be an equal? Will I be there to fill a personnel quota or will I hired because of my talents? Let’s allow each person to be as they happen to be – whether it’s a collection of coke cans or a small explosion of glitter in one’s cubicle. Many don’t trust in our ability to defend its territory. Something has failed in communicating our defense capabilities to the public. Finland, as a matter of fact, is a very difficult country to enter into by force. 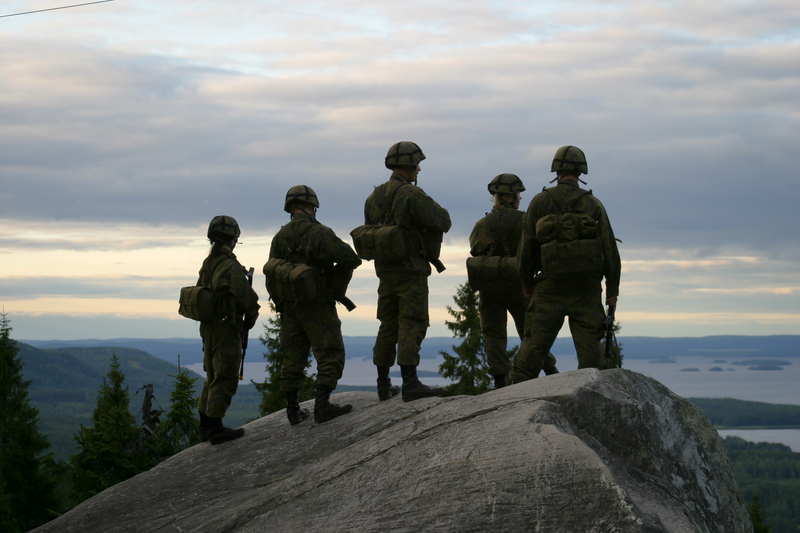 Finland’s defense has several strengths: the will of the people, the skills of the recruits and the personnel, and the terrain. No attacker can drive nor walk into our country without having to pass again and again through narrow waypoints, swamps, roughs and lakes that are easily defended by limited troops. Also Finland’s shoreline is riddled with hidden rocks, shallows and narrow passes. Why is it then that our defense capability is not trusted? The message isn’t carried from the Defence Forces to the people as it should. Our defense talk is primarily on funding cuts and the frequent difficulties in materiel acquisitions. We have created a spiral of negativity.